If you have twins or two young children of similar ages, you’ll need a double stroller. And if you enjoy keeping fit and exercising, you’ll need to buy two strollers; one for regular work and one for jogging or running right? Well, strollers are an expensive purchase, and the good news is that you can buy one stroller that will comfortably do both these jobs! 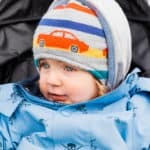 In this article, we take a look at two popular, affordable double strollers that their manufacturers market as suitable for jogging, off-roading, and regular shopping trips too – the Baby Trend Expedition and the Graco FastAction Fold Duo Jogger. To make it easier for you to choose which stroller would be the best option for you, we’ve matched these two high-quality products side-by-side in an in-depth comparison. 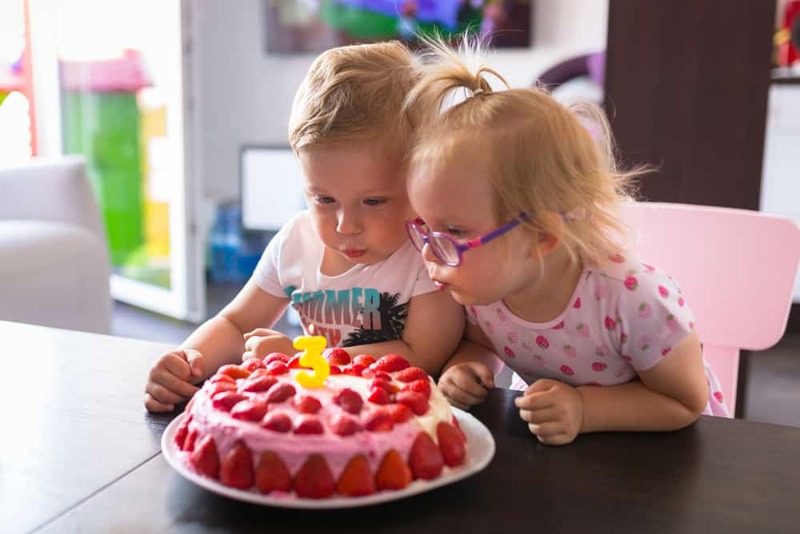 Baby Trend has been producing high-quality, durable products for kids, including car seats and strollers for over 30 years. All Baby Trend’s strollers are carefully engineered for safety, longevity, and reliability and are designed to help you face the challenges of a growing family. And all at an affordable price. Philadelphia company, Graco started life as a manufacturer of car and machine components. In the mid-1950s, Graco broadened its horizons and began making car seats, swings, cribs, and strollers. Today, the company produces durable, well-made strollers that are surprisingly well-equipped and stylish, despite their budget prices. Graco regularly upgrades their range, which now includes a wide range of three-wheeler joggers. 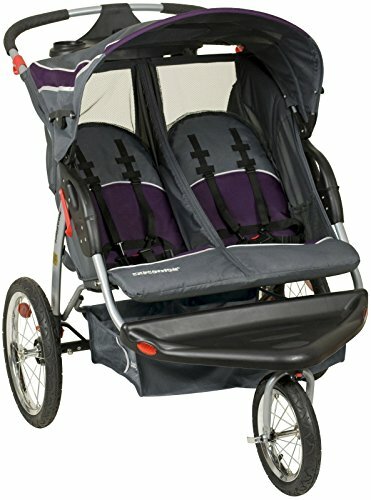 The Baby Trend Expedition Double Stroller is the perfect buy for active parents who are on a tight budget. The Expedition is a side-by-side, all-terrain stroller that can handle a variety of surfaces, including dirt trails, uneven sidewalks, gravel, grass, and roads. 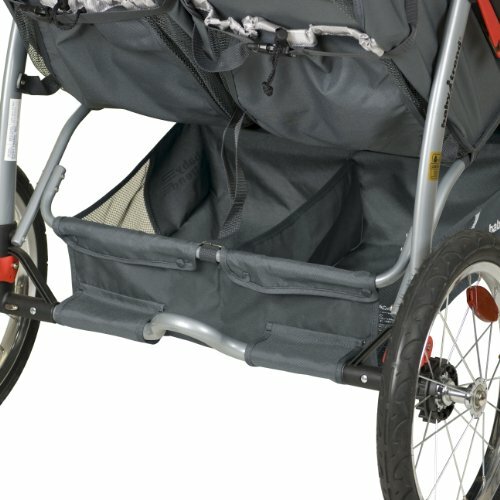 Although most parents who buy this stroller are not hard-core runners or joggers, it will still serve you well if you enjoy a brisk walk and like to explore off-road trails with your children. The three-wheel design and pneumatic rubber wheels make for a smooth ride and easy push over most terrains. The stroller is easy to fold, provides equal, independent recline for both seats, has extra ventilation for passenger comfort, and features a generously-sized underseat basket for all your baby essentials. And while you exercise, you and your kids can enjoy your favorite tunes thanks to an inbuilt MP3 speaker fixed to the canopy. How cool is that?! Graco’s FastAction Fold Duo stroller has a sturdy frame that’s narrow enough to fit through standard doorways but can still hold two children up to 50 pounds in comfort. Both seats have a decent-sized sun canopy, and there’s plenty of ventilation provided by mesh peek-a-boo windows. If you like to drive to your favorite playpark or off-road adventure experience location, there’s no problem! 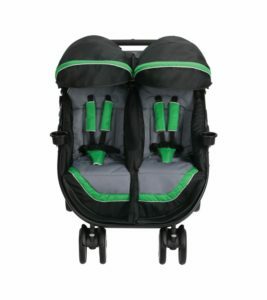 The FastAction Fold Duo comes with two car seat adapters and is compatible with all Graco Click Connect infant car seats. There’s lots of underseat storage space with easy access, cup holders, and a parent organizer tray too. Now, let’s take a closer look at what these affordable double strollers have to offer. The Expedition measures 31.5” W x 46” L x 42” H. At a weight of just 32.5 pounds, this is a pretty light double jogging stroller. 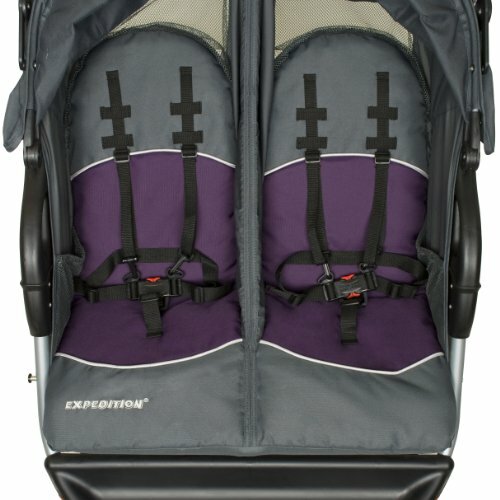 You can use the Expedition for children up to 50 pounds in weight and up to 42 inches tall. The Graco FastAction Fold Duo weighs 32.9 pounds, so it’s comparable with the Expedition. When folded, the Graco’s package will fit into most trunks without difficulty, measuring 17″ H x 32″ W x 30.5″ D. The strollers can handle hefty toddlers of up to 50 pounds per seat. 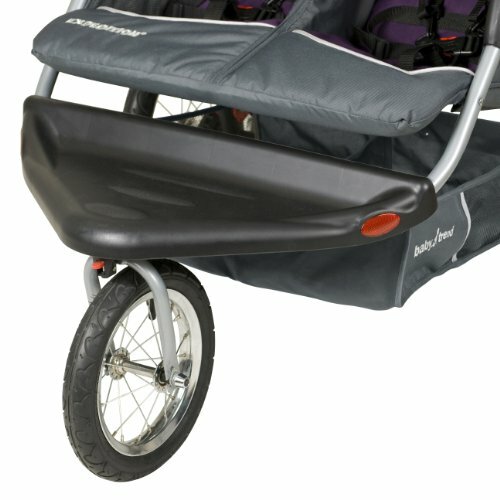 Double strollers are not noted for their easy handling, but the Expedition is very easy to fold and light to carry. The fold is a two-handed process, but it is straightforward and smooth. If you have a small car trunk, you’ll find removing the wheels is quick and simple to do and gives you more space. The FastAction Duo is very easy to fold and has a handy auto-lock feature too. That said, you will need two hands for folding and unfolding the stroller, and it isn’t self-standing when folded. Safety in a stroller is paramount, especially when you have two kids on board. The Expedition has a five-point safety harness that’s parent-friendly but would be difficult for a child to unfasten. The Expedition has a wrist tether that prevents the stroller from running away from you should you trip or fall while you’re jogging. This safety feature is especially useful if you’re traveling downhill with two heavy toddlers onboard. The Graco FastAction Fold Duo also has a five-point safety harness in each seat. The harnesses are adjustable and have three height levels, which allows the stroller to grow with your children. Some users comment that the strap harness system is somewhat fiddly to put on, especially with a squirming child in the seat. The buckle fastening needs two hands to release the straps. Although it’s easy for parents to undo, it is beyond the ability of most toddlers. The Expedition has three wheels. The front wheel measures 12 inches in diameter, and the rear wheels are 16 inches in diameter. The front wheel pivots but can be locked straight for extra stability and more secure steering over uneven terrain. The Expedition’s tires are air-filled, which gives your passenger a smooth, cushioned ride, and makes for an easy push for you too. The downside is that you do need to check the tire pressures regularly. Just like a car, if the tire pressures are unequal, the stroller will not roll straight, especially with two large kids onboard. Also, you’ll need to buy an air pump in case you get a flat. Graco FastAction Fold Duo has solid plastic tires and dual front wheel design. Although you don’t need to worry about being stranded somewhere with a flat, the Graco is more awkward to turn and push than the Expedition. You may also find that you continually kick the rear of the stroller repeatedly while strolling, especially if you’re tall and have a long stride. The Graco FastAction Fold Duo is meant to be one of the narrowest side-by-side strollers on the market, but it isn’t as easy to fit through standard doorways as the Expedition. You may also find cornering with the Graco is a challenge compared with the Expedition’s comfortable, smooth handling. Unfortunately, the Graco FastAction Fold Duo is not very adept at handling varied terrain. Although the short wheelbase allows for pushing across grass, uneven pavements, and smooth roads, the stroller struggles on gravel and when negotiating curbs. Neither the Graco FastAction Fold Duo nor the Expedition stroller has an adjustable handlebar, but both are a reasonably easy push for parents of varying heights. The foot-action brakes on the Expedition are located one on each rear wheel. You set and release the brakes by applying light downward pressure on the levers. The Graco FastAction Fold Duo has double-action brakes like the Expedition. The brakes are easy to apply and are flip-flop-friendly. A better design might be to have a single-action brake pedal, rather than having to apply each brake separately. That can be a potential safety issue if you forget to engage one brake when the stroller is fully-loaded. The Expedition has generously-padded seats with individual recline functionality. The seats recline to a completely flat position, making this stroller suitable for newborns. The seat fabric can be cleaned easily, using mild detergent and warm water. The Graco FastAction Fold Duo stroller has leg rests for extra passenger comfort, but unfortunately, they are not adjustable. Like the Expedition, the Graco stroller has a recline feature for each seat that allows you to tilt back the seat to an infinite number of positions, including flat. The Graco FastAction Fold Duo’s seat is well-padded and comfortable, and spills can be cleaned up easily with a sponge, warm water, and mild detergent. The canopy on the Expedition is adjustable and stays firmly in position, even on very windy days. A smart idea that Baby Trend have come up with is the inclusion of an inbuilt MP3 speaker that’s sewn into a pocket on the inside of the canopy. So, you and your kids can enjoy your favorite music while you’re out and about. The speaker has a male jack cable that’s compatible with MP3 players, iPhones, and iPod devices. The Graco FastAction Fold Duo has individual canopies for each passenger, which can be adjusted individually. The canopies are a reasonable size with extra ventilation and mesh peek-a-boo windows. You won’t be short of storage space if you buy the Expedition! This stroller has a large underseat storage basket that will take diaper bags, drinks, snacks, etc., and you also get a parent tray with two cup holders. The storage basket on the Graco FastAction Fold Duo stroller is also sizeable but is divided into two sections, which is handy for keeping your things organized. The baskets are accessible from the sides and the rear. The maximum capacity of each basket is 10 pounds. Also, you get a parent’s console with two cup holders and a storage tray. Both passengers get a swivel cup holder attached to the side of the frame. Although standard size bottles won’t fit into the cup holders, they will take a sippy cup. You can convert the Expedition into a travel system that you can use for a newborn if you buy the Expedition LX Millennium Travel System. Although the Graco FastAction Fold Duo is car seat compatible and takes two seats simultaneously, it will only accept Graco infant car seats. However, on the plus side, the attachment points are integral to the stroller, so you don’t need to purchase anything separately. The Expedition comes in a pleasing range of colors, including Skylar, carbon, and frost. 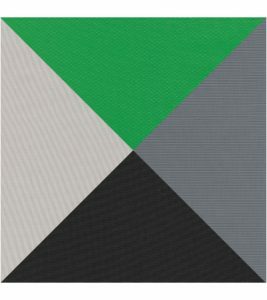 The Graco FastAction Fold Duo is available in black or fern. Although the Baby Trend Expedition and the Graco FastAction Fold Duo are both marketed as all-terrain joggers and sit in the same price bracket, there are significant differences between them in terms of performance. If you want a stroller that will comfortably take two large children and can handle off-road excursions, you should seriously consider the Expedition. This three-wheeler is much easier to maneuver and push than the rather clumsy four-wheeled Graco FastAction Fold Duo. There’s plenty of underseat storage space for essentials, a decent-sized canopy, and cup holders galore! We love the addition of an inbuilt MP3 speaker too! Most users would not recommend using the Graco FastAction Fold Duo for jogging because it’s too awkward to turn and steer, especially with two kids on board. However, if you want an inexpensive, well-made stroller that you can use for trips to your local store or the park, the Graco FastAction Fold Duo will probably be fine for you. There’s plenty of storage with the sizeable underseat basket, parent tray, and cup holders too. Both these strollers are car seat compatible, although you can only use the Graco FastAction Fold Duo with Graco’s car seats, and you’ll need to buy Expedition LX Millennium Travel System if you want to use the Expedition as a travel system for a newborn.